Known to be America’s most popular and loved driving destination, even the slightest jaunt on the PCH will leave you in awe. Stretching just over 1000 kilometres, it tightly wraps the coastline, offering some of the most stunning, unobstructed views I have ever seen. It was love at first sight. In my California trip, hitting the road was one that I looked forward to the most. Seeing Los Angeles and San Francisco has been undeniably fun and enjoyable, but the road trip was something different, something beyond sight-seeing — it was an adventure that fuelled a strong sense of wanderlust and soul-searching, which evoked a fluctuation of mixed emotions. They say, many a honeymoon has been spent, a book born and a virgin road trip consummated along the PCH’s wonderfully winding route. Not the least surprised. Given just ten days in California, Bibiana and I braced the PCH in two full days covering 500 miles, heading north from Los Angeles to San Francisco with an overnight at San Luis Obispo, or Slo. Our PCH road trip itinerary were mapped out as such with the following picturesque pitstops. We embarked on our road trip from Los Angeles at 10am. As excited as I was about the adventure, I left Los Angeles with a heavy heart. 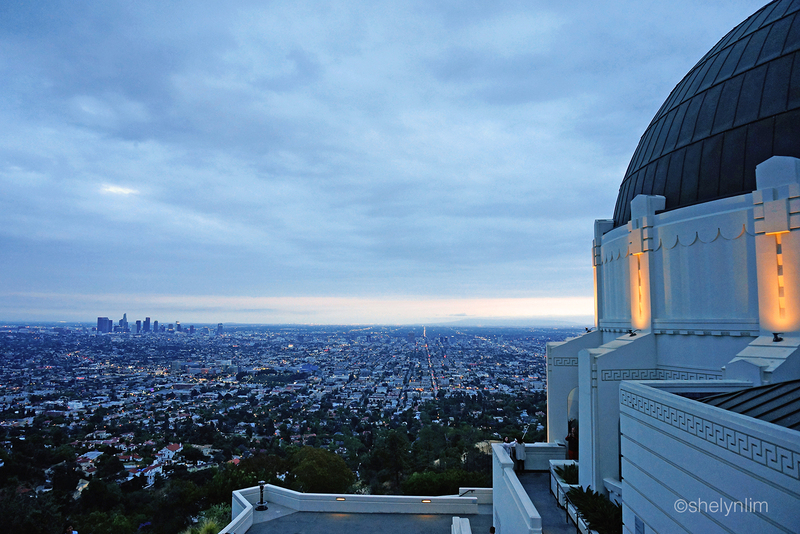 The city was something truly special, especially at the Griffith Observatory where I recall just taking it all in, overlooking the entire city as the sun sets and city comes to light. It was a view forever imprinted in my mind. Up at Pepperdine University campus, a concealed yet perfect vantage point for a breath-taking view of the Malibu coast. The Malibu Pier where the widely celebrated Malibu Farm Cafe is beautifully set above the ocean, perfect for brunch with everything served farm fresh. We made a quick pitstop at this peaceful, quaint little town with trails of Spanish influence. I would suggest spending no more than an hour if you’re racing against time. Santa Barbara is a must for anyone doing the PCH road trip. A very charming city very much alike the quaint Ventura but livelier with the presence of both locals and travellers. Influence of the Spanish from 1600 can be seen throughout the colonial facades, with the Mission being the city’s treasured landmark. There’s ample to do around here — see animals at the Santa Barbara zoo, sample Santa Ynez wines, shop on State Street and Paseo Nuevo, or simply unwind at the idyllic beach. After all, the city calls itself the American Riviera. 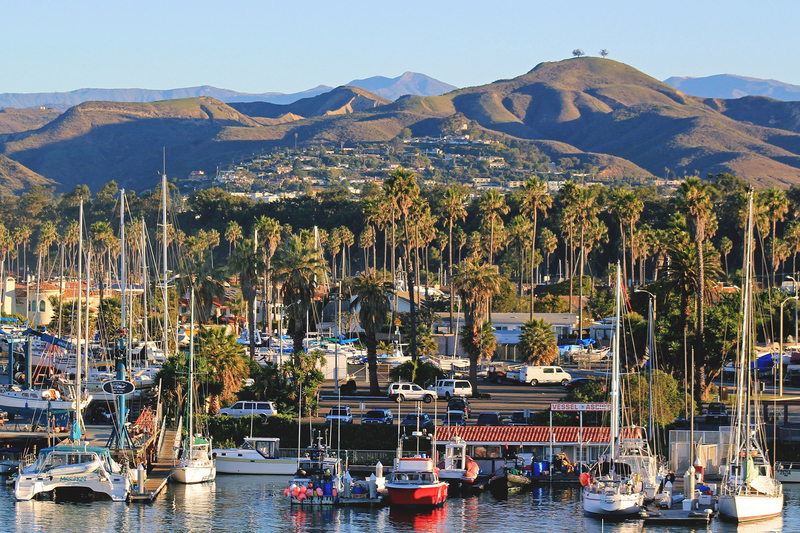 Not far from Santa Barbara lies the surprising county town founded by Danish Americans. The collage of windmills, bakeries, and dated souvenir shops makes a stroll or drive by worth while. It was rather quiet during our visit with some shops closed at tea time, but a little less buzz won’t hurt. In fact, it probably adds on to the authentic Danish lifestyle experience. A classic Californian central coast beach town that has an extremely relaxed and cosy vibe. Pismo beach seemed to me like a much quieter, toned down version of Santa Monica beach, which makes a perfect place for a romantic evening stroll in the sunset. Little one-storey shops and restaurants huddle together by the beach, usually with a dimly lit interior and a contrasting neon sign board, although none of them seemed to flicker. En route to our final destination to end the first day of our road trip, midway between LA and San Francisco is Slo, a popular overnight stop among road trippers. With a large open space bounded by lush mountains, pristine beach, extensive hiking and biking trails tread through the city and year round sunshine, it gives way to various outdoor activities — Bishop Peak being the popular hike for those who fancy a stunning view. By the time Bibiana and I arrived at Slo, restaurants were soon closing after dinner. We managed to nip into the highly rated Firestone Grill downtown. I went by a friend’s recommendation and tucked into the local tri-tip steak sandwich. It did not disappoint one bit. The meat was heavenly and well-matched with a perfect amount of house BBQ sauce. After the entire day behind the wheels, all we were looking for was a good shower and the perfect bed. Our lodge for the night, San Luis Creek Lodge is the perfect boutique hotel that charms with a character of its own. The interior seems a little dated but it’s really just the intended style. The best part about this hotel were the blanket and bed sheets. They were literally the softest and most comfortable I had ever slept in, like a bed of cushioned fresh snow with micro-weaved silk. After a great nights rest at San Luis Creek Lodge, we hit the road early around 9am. Morro Bay was the closest stop nearest to Slo, only 13 miles away. With its calm, flat waters, nature-oriented activities take centre stage here — kayaking, hiking, biking, fishing, and wildlife-watching around the bay. 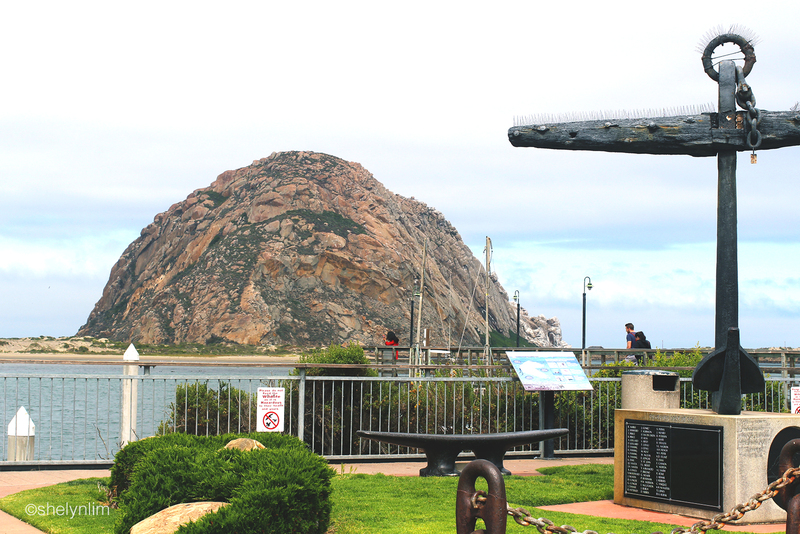 At the mouth of Morro Bay stands the iconic 576-foot-high Morro Rock, one of the nine small volcanic peaks in the area. Another 45 minutes headed North and we’re at one of the major attractions along PCH — the Elephant Seal Vista Point in San Simeon. Do not miss this. 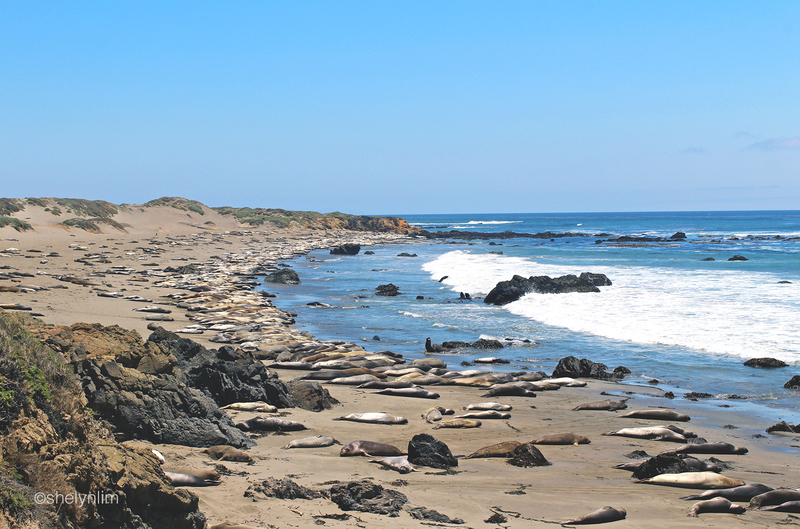 Adjacent to the parking lot lies thousands of elephant seals on the beach, molting away (shedding off old skin for new). I can assure you the seals are very much alive. We were lucky enough to witness the antics of these mammals, including occasional brawls between the juvenile seals. Shortly after the continuation from the elephant seals rookery, the best part of the road trip was about to begin — the famed Big Sur. If this is your first time hearing about Big Sur, I’m glad I’ve introduced this 90-mile stretch of beauty to you. It is certainly right up there with New York’s Times Square on the list of must-sees for many visitors to the United States. With the winding roads above the jagged coastline, the drive could be a little challenging for some. But without the steepness and the askew landscape, Big Sur wouldn’t quite be Big Sur. Once we ascended to a certain height above sea level, the sheer magnificence of Big Sur swept us away. The Pacific Ocean was glistening under the sun rays, mildly crashing the rocks at the bottom with droplets of sea water gently whisked by the passing cool breeze. It was Mother Nature in all its glory. The first half of Big Sur was so beguiling that we unknowingly spent a few hours making pitstops and wandering off to the furthest lookout points. We thought the rest of the journey couldn’t get any better. Upon entering Julia Pfeiffer Burns State Park, tall redwood trees lined up the roads with cars clustered on both sides. We followed suit and pulled over, trailed the small crowd towards the paved slopes that led us towards the edge of the mountain. The ocean was instantly within sight, along with the iconic 80-foot McWay Falls pouring onto the beach all year round. It was simply beautiful. Waiting ahead is yet another PCH landmark, the aesthetically pleasing Bixby Creek Bridge with a slender looking arch, noticeable from miles away. Set against the stunning Pacific Ocean, it was a sight to behold. With the sun seeming to set quicker at every second, we cruised past the highly rated Monterrey that has equally stunning views and headed straight for the waterfront of Santa Cruz boardwalk. We narrowly missed the bustling fun at the boardwalk as it closed at 5pm on the day. Nonetheless, Bibiana and I enjoyed the boardwalk at its calmest with a stroll. The sun has nearly set on the horizon and San Francisco welcomed our arrival with Karl the fog smothering us up-close on our windshields. This was the classic San Francisco experience they say, nothing completes the city like Karl. We arrived at the city two hours before midnight with two full days ahead exploring the area. Big shout out to my adventure buddy, Bibiana for being so amazing behind the wheels throughout the entire PCH. You are a star. It’s approaching two months since my California adventure and yet I could barely bring myself away from the overwhelming road trip experience that seemed to have whizzed by in the blink of an eye. One of the biggest reasons why I adore the coastal drive is that it has this irresistible spellbinding power of making all my worries and qualms obsolete. The sight of it takes over all other senses. Like ecstasy, I was forever hooked on this magical experience. Thanks, Rae! Have you been to Cali? ps: bookmarking your blog for times of sinful indulgence. My favourite road trip! The view is incredible. I went back in 2010, with my parents, and each stop along the way was amazing. It is stunning. How many days did you spend on the road? I read that you’re itching to be back in London, it’s really a great city too. I’ll be more than happy to offer some tips if you ever need. Thanks, Dave. California is such a great state and there’s so much beauty in and out of the cities. It’s definitely one that has to be visited more than once. Which parts were your favourites? My wife & I are planning the PCH trip in March. Can you suggest any must stay overnight hotels along the way? Should we take 2 or 3 days? PCH is quite a distance, I would recommend 3 days, or even more, if you’re not pressed for time. I stayed in San Luis Creek Lodge in San Luis Obispo, it was the perfect middle point to break up my journey from LA to SF. San Luis Creek Lodge would be good if you decide to stop off in SLO, it’s for anyone who appreciates privacy and a boutique hotel experience – reasonable price for $130/night with breakfast for two. Nice article, I can sense your joy. We’ve just come back from our road trip after doing LA to Seattle via the PCH, (900 miles as the crow flies, but more than 2,000 doing the route we took). It was demanding at times, (hairpin bends on cliff roads with low loaders coming the opposite way), but well worth it for the views and change of pace between stops. I completely missed Solvang, so after seeing your article we will definitely call in on it if we’re in Cali again. Hearst Castle near San Simeon is an interesting stop, as is the sweet little seaside village of Carmel by the Sea, full of cottage like houses and almost European in style. Thanks, Steve. I can only imagine how you must feel to be home after 2000 miles on the road. How many days did it take you to complete your journey? Which were your favorite bits? I heard nothing but great reviews on Carmel by the Sea, I’ve whisked past it but will be back to do it properly in the future. Hey Chelsea, that’s exciting! 4 nights sounds like a great amount of time to enjoy the PCH. Happy to help, what sort of advise specifically are you looking for? Thank you for taking the time to catalog your PCH adventure. I’m planning a trip for my bf and you have given me many places to add to my “must-see” list. This has been a very helpful post. My wife and me are planning this month and probably include Carmel by the sea? We plan to spend two nights on the road starting from San Francisco and ending at Chino Hills, Any suggestions of what are the best places to stay, Was planning Carmel for the first night but suggestions. Thanks Rajesh. Carmel by the sea was one of the top places recommended for those doing PCH. I’m unable to make a specific recommendation as I haven’t stayed there personally but you can find a very comfortable inn or hotel for $200 a night, and one that is facing the sea too. In 2 nights, you’ll be able to enjoy the road trip comfortably and fit in the main sights that I think you should not miss – Carmel, McWay Falls, Elephant Seals Rookery, Santa Barbara. If you find yourself short of time, and need to leave out some places, I’d leave out Solvang and Ventura. Hey Klaye. If this post has influenced your decision in any way, I’m flattered and glad to hear. You are in for an amazing holiday, truly. Just be sure to spend at least 2-3 nights on the road or you may leave aching to stay longer like I did. Bon voyage! What were you favorite stops along the way? Hey Olivia, that’s going to be a fun trip! 5 days is just about enough and you can fit in 1-2 nights in LA if you wish to (Griffith’s Obserservatory and Santa Monica are my favourites). That leaves you with 3 days towards SF, and I would not have missed: Santa Barbara, Elephant seal rookery, McWay Falls. If I had an extra day I’d spend more time at Julia Pfeiffer Burns state park with some outdoor activities. Regardless, a quick drive by would still give you that sense of enjoyment. Hope that helps, and that you’ll have an amazing time! Thanks Shelyn! Very helpful – cannot wait for the trip. I’ll be sure to hit up some of your suggestions! We did the drive this July . Felt that even two nights was not enough. A bit stressful if you have a room booked and you gotta catch it. We left Carmel at 6 pm towards Cayucos and so Big Sur didn’t happen as much as we wouLd have liked as there was fog and the hill drive is better completed before dark esp drivin in US for the first time. Quite an experience though. That’s a good tip Rajesh. I agree that to really have an enjoyable pace at Big Sur, 2 nights is the absolute minimum. I hope the next time you take on PCH again, let Big Sur take your breath away. HI Shelyn, we are 2 couples planning to travel together from San Diego to San Francisco in a two week time period, summer of 2017. Your site gave us some really good information about places to stop and things to see along the way. We are also thinking to include Napa Valley near the end of our trip. The pictures you have posted are absolutely stunning, and surely stirs even more excitement about our trip! My husband would really like to experience the very large redwood trees. Is there a spectacular spot along the way that we can visit and allow him to cross that off his bucket list? HI Shelyn, me and my girlfriend are planning a trip from England in September 2017. We plan to fly into LA drive up to San Fran and then catch a flight from San Fran to Vegas in the period of 16 days. Hoping to pretty much match what you have done during the drive from LA to San Fran in possibly 2/3 days (do you think this time frame is possible)? It’s so hard to work out where to visit during our short stay as there seem to be so many beautiful places and we just want to visit as many as possible without having the rush! Your blog has given us such an insight so thank you! After looking at this in further detail, we would be staying in Anaheim for Disneyland and then looking to drive up to San Francisco over the course of 3 days and 2 nights. We are considering staying over in San Luis Obispo and then Santa Cruz (spending 1 night in both places). Do you think these are sensible stops or would you recommended spending a night along one of the other places you visited? It would be great to get your feedback. I am planning a trip out west from the Sacramento/San Fran area all the way down to San Diego. What would you recommend as the best amount of time for this trip? I have about 10 days to do so, would this be enough time or would you suggest extending my trip? Hey Nick, with 10 days for trip, you’re in for a decent getaway. Personally, I think 10 days would give you enough time to make a pitstop for a day or two at each main points and it would still be at a comfortable pace i.e. Carmel, Big Sur, Santa Barbara, LA, San Diego. I would recommend sparing 3 nights each for LA and San Diego, and the remaining nights for the drive down from San Francisco. If you would like to do more outdoorsey stuff in the national parks and less of the city, then 4 nights for the drive down would be sufficient. Any more than that may feel like a bit of a drag. It was my first time in California when I spent 5 nights in LA, and I thought it still wasn’t enough. I guess I had a lot on my list. I wouldn’t leave too little for the cities, especially if it’s your first time, there’s so much to do down there. Hey Polina. NYE in SF sounds like a lot of fun! I stayed at a friend’s place in Mission district during my visit, sadly I can’t pass on any great recommendations on which hotel to go to. I suggest you should start with which district you’ll like to stay in (perhaps a close proximity to the places you’d like to visit throughout your stay there). Instead of staying in downtown, my top 2 choices are Mission and Marina.